Frank & Bro. were a hardware business in New York City from 1888 to 1955. The brothers were David Frank (1860?-1937) and Max Frank (1864?-1944). Their business was located at 97 6th Ave. from 1889 to 1920. 1889-1920 hardware 97 6th Ave.
1921 hardware 29 Greenwich Ave.
1922-1936 roofing 29 Greenwich Ave.
1937-1946 roofing 304 W. 13th St.
1947-1953 Maintenance Corp. 747 Washington St.
1954-1955 Maintenance Corp. 120 Bank St.
David and Max Frank were the sons of an immigrant butcher from Prussia, Philip Frank. Philip Frank appeared in the 1870 U. S. Census living in New York City's 8th Ward with his wife Etta (Henrietta, also called Yetta) and their seven children. All of the children, ages 13 to 1, were born in New York. At that time David was 11 years old and Max 6. Ten years later, 1880, the family lived at 101 Clinton Place. (Clinton Place was renamed 8th St. circa 1880/1890.) David was 21, a bookkeeper, and Max 16, a clerk in a shirt store. By 1900 David Frank was 35 years old, lived at 74 Perry St., and had his own family consisting of his wife, Anna, and a daughter Pearl, age 1. Max Frank lived with his older brother, Louis, at 318 W. 22nd St. Among Louis Frank's family was his mother, Yetta, age 69, a widow. Both David and Max gave their occupations as "hardware." In 1910 David Frank lived with his brother-in-law, Emanual Berg, who had married his sister, Clara Frank. Their mother, Yetta, now age 77, lived in this household. And David Frank was a widower. His daughter, Pearl, was now 11 years old. Meanwhile, Max Frank was now married and lived with his wife, Eva, at 862 Park Ave.
By 1920 David Frank lived with his younger brother, Leopold, on W. 24th St. Pearl, an artist, was part of this household. Max Frank lived with his wife, Eva, on E. 81st St. In 1930 David Frank, age 71, gave his occupation as "None." Apparently he had retired from the business by that time. 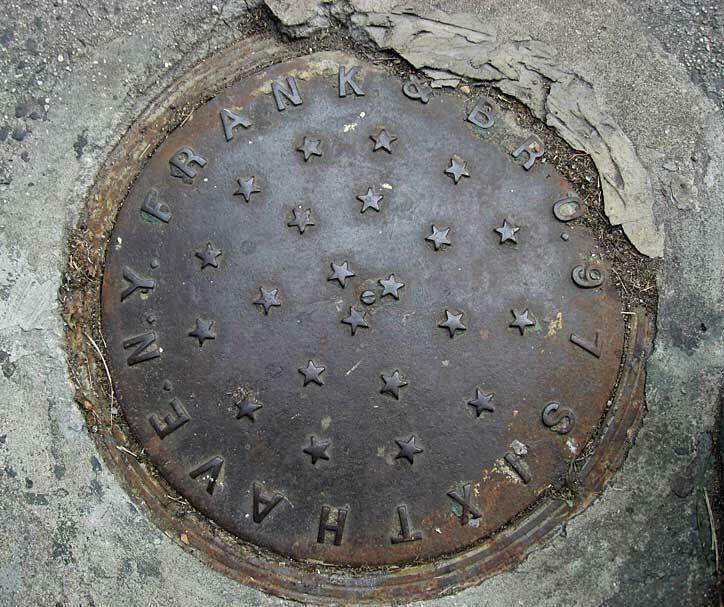 Max Frank, age 65, gave his occupation as "Proprietor, Metal." David Frank's death notice, New York Times, 18 Dec. 1937, read, "Frank - David, beloved husband of the late Hannah, devoted father of Pearl, brother of Clara Berg, Lena Maier, Leo, Max and Ben Frank. Funeral service West End Chapel, 91st St.-Amsterdam Ave., Sunday, Dec.19, at 10 A. M."
Max Frank received a similar notice, 13 Feb. 1944, reading, "Frank - Max, beloved husband of Eva (nee Bowman), dear brother of Clara Berg, Lena Maier, Leo, Ben and the late Louis, David and Isaac Frank. Funeral service, West End Chapel, 91st St. and Amsterdam Ave., Monday, 2 P. M."